It’s easy, call 877-994-6645 or fill out the form below to get started. Listings are free. Leads are always validated for quality. Hometown marketing leads are the hassle-free way to get new customers! Hometown leads are actual “Requests for Estimates” to demolish a structure. Some other demolition marketing services offer “clicks”. A click is not a request for a demolition estimate. It’s a click. Demolition contractors paying for clicks or “guaranteed clicks”, often get a bad deal. How many clicks does it take to get one phone call from a qualified demolition lead? A lot. With Hometown, you never pay a dime unless you get a demolition estimate request from a qualified lead. Contractors should not pay for Demolition advertising unless that advertising actually works to create new demolition leads. Many demolition marketing services lock the demolition contractor into a monthly fee, regardless of the number of quality leads generated. That’s risky, because you may not get any quality leads for that monthly cost. Hometown removes all the risk. demolition companies pay for performance only. If no quality demolition leads are generated, then there’s no cost. With Hometown’s Lead Tracking Center, demolition contractors can login and see the name, number, date and time of every phone lead generated from their demolition advertising. Every call is recorded and can be listened to at any time, so there’s never any question about what leads you’ve received from your demolition advertising. Hometown will send you high quality house demolition leads, but what about the other services you provide? No problem, Hometown markets your business for other related services you provide, such as: commercial, barn, interior, and mobile home demolition, concrete, chimney, pool, and oil tank removal. This is a great way to grow your business in other related services! 8 out of 10 customers now read reviews before making buying decisions. For demolition contractors, this means the absence of an online reputation or a poor online reputation results in lost sales. 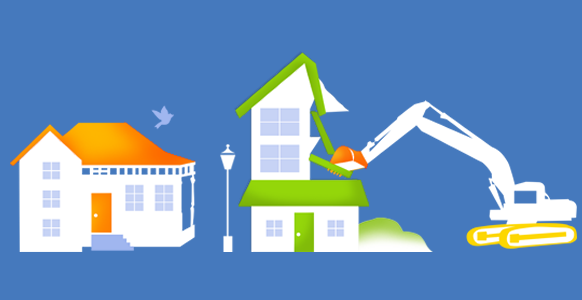 HometownRep is a free, no-hassle way for demolition contractors to establish and improve their online reputations. Hometown does all the work to collect trusted reviews from customers that find you on Hometown Demolition Contractors. No anonymous reviews from sneaky competitors are possible with HometownRep. Every review comes from an actual customer. Some lead generation services require you to write your own content. Hometown is a web team that works hard to simplify your life, so you can focus on what you do best, run your business! We build out all of your content for you. If you need us for any reason, our Client Care team is there for you. Hometown keeps it simple and hassle-free. The cost for a demolition lead from Hometown is typically less than a lead from other lead generation services. Demolition leads are only $14 to $39. Hometown offers better leads at lower prices. Get more new customers fast! Get visibility across your service area on our market-leading websites, used by millions of customers to find a demolition contractor. Get introduced to new customers in your area so you can book more jobs. Pay only for introductions to real customers. Get your company found for related services, such as: pool removal, barn demolition, commercial demolition, concrete removal, etc.